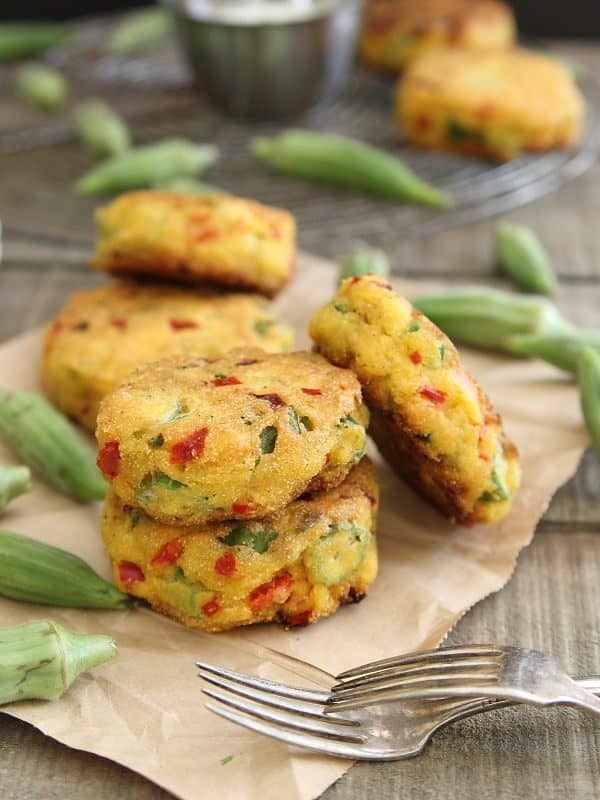 These okra cornmeal cakes are pan fried with a crispy outside and spicy soft center. 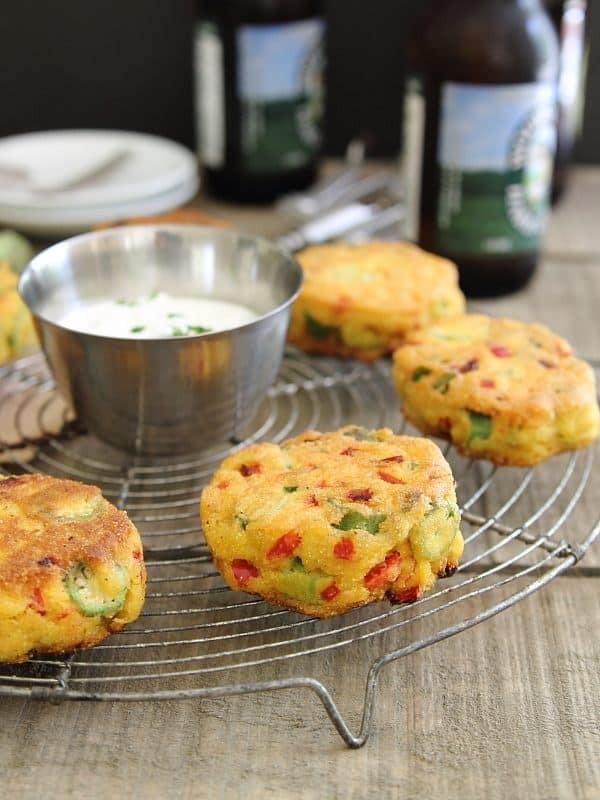 They’re perfect with the refreshing cilantro lime yogurt dip. Sometimes there’s really not much to say about a recipe. 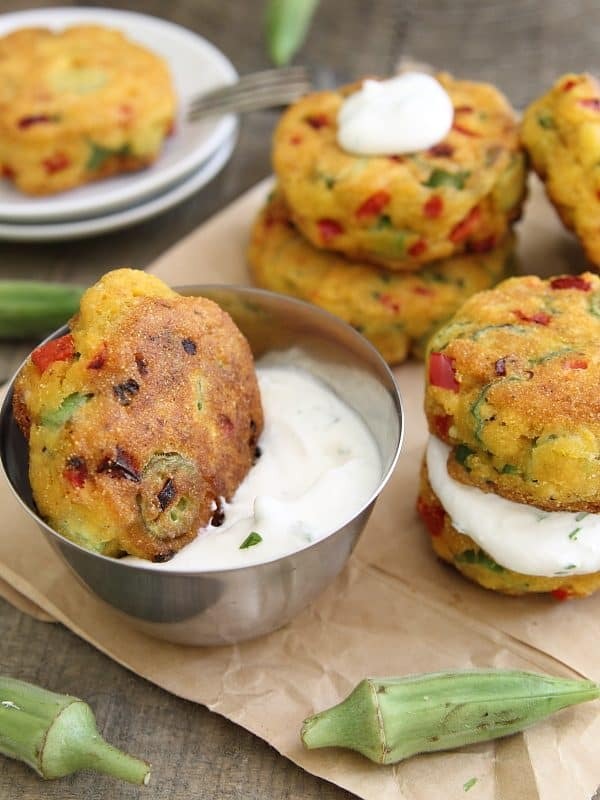 Why okra cakes? Well, to be honest, it all has to do with stubbornness. Okra can be gross and I can be stubborn. So obviously that meant I needed to come up with a way to enjoy eating the slimy-interior wheel shaped vegetable besides just frying into little bites (because if you’ve never tried it that way, it’s gooood). I did, the result are these crispy cornmeal cakes and they’re pretty delicious but really, I have nothing else to say about them other than that. 1. Did Vegas become an Asian hot spot or something? I’m one of maybe 3 non-Asians on this flight. And I’m on Delta, not like Cathway Pacific or something. Odd. 2. Why oh why did I not carve out time to get a pedicure before this trip? Every time I glance at my non-polished toe nails in the flip flops I’m wearing right now, I want to cringe. I hate naked toes. 3. What the HELL is the man sitting behind me doing to the back of my chair? When I sit on a plane, I don’t touch the seat in front of me unless absolutely necessary for tray table adjustments. In fact, I try not to touch anything (hello, germ factory) so when someone can consistently pound the back of mine for 4+ hours, I legitimately do not understand what they could be doing. 4. I have 7 Delta drink tickets sitting in my wallet from back in the days when I was a fancy schmancy (yeah, not really) business traveler and yet, I always find myself on horrifically early morning flights where I can’t even think of drinking anything but coffee. 5. Are we going to end up having to eat at crappy chain restaurants this whole trip? A quick search last night for semi-decent restaurants surrounding the national parks looked pretty grim. 6. I don’t even know what time zone Vegas is in. And then to complicate things, we’re driving to Arizona. Doesn’t Arizona not do daylight savings? Or is that another state? Why are random states even allowed to make up their own time. If there’s one thing the government should regulate, it should be the damn time! 7. I forgot to reprogram the thermostat downstairs while we’re away and considering our electricity rates doubled in the past 2 months, that’s just awesome. At least the plants will be nice and air-conditioned. 8. I can’t believe I paid $4.59 for a Cliff bar at the airport when I packed 6 of them for the trip. And then left them in the bag I decided to check last minute. 9. People who leave their window shades down on a plane when not watching tv bother me. How can you not want to look out the window?! 10. Does getting up at 2:45am mean I can eat an extra meal today? 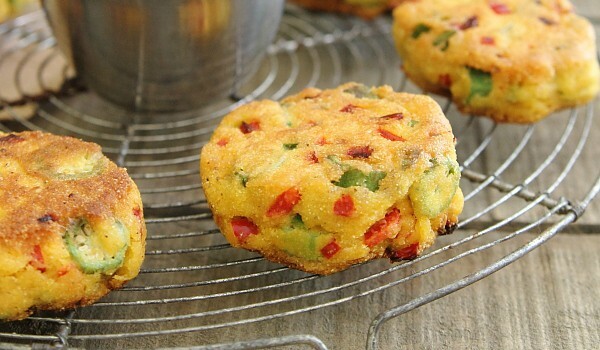 These okra cornmeal cakes are pan fried with a crispy outside and spicy soft center. They're perfect with the refreshing cilantro lime yogurt dip. Combine the cornmeal, baking powder and salt in a large bowl. Add the egg and water mixture to the cornmeal mixture and stir together with a spatula. Mix in the okra, jalapeno, red pepper and garlic. Once hot, form the batter into patties and pan fry on each side for about 3 minutes until golden brown. Mix the yogurt, lime and cilantro together in a small bowl and serve with the hot cakes. That always goes through my head on early morning flight days! I hope that you have a fun trip and these look fab! Supa creative and ANYTHING with cilantro lime dip is always a good choice. Pinned! I think it still counts as a vacation. And mimosa? You can drink in the morning!! There’s always okra sample at my grocery store, and I’m always intrigued by it, but never know what to do with it. These cakes look like the perfect vessel for those interesting little buggers! Fresh okra + summer + pan fried = awesome! I tried these last night. The concept was good, but the recipe didn’t have enough binder and I couldn’t even form cakes with it. I ended up making them as best I could and baking them, since flipping was not an option. The batter was extremely dry. I will try again with my own corn batter recipe. I made these today but added some onion and fat-free cheddar cheese. They were very good.